The Ark Hotel, in the city of Changsha, was constructed with all prefab materials and is soundproofed, thermal-insulated, and reportedly capable of withstanding a magnitude 9 earthquake. The construction workers who put it together worked until 10 pm every night, and none were injured in the building process. To me, this hotel is the paragon of Asian-ness, in its show-off-y efficiency–it was prefab, inexpensive, quickly-built, and generated only 1% construction waste–but I happen to know one Asian person who’s not so impressed by it. That is Hardass Asian Parenting to the core! Oh yeah, you built a building in 6 days? SOFA KING WUT? And, while we’re on the subject, why couldn’t you do it in 5?! Thanks to my Hardass Asian Daddy! Happy birthday to Ichiro, who turns 36 today! 2009 was a huge year for the mononymous outfielder: he set a major league-record of nine straight seasons with 200 or more hits, finished the season with a league-leading 225 hits, hit his first career walk-off home run (against the Yankees’ Mariano Rivera, no less), and even drew his first career ejection for arguing a called third strike. 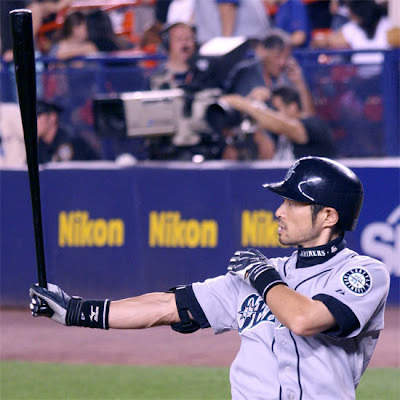 But hey, we’re talking about a dude who’s single-handedly proven to Americans that Asians can bring it on the baseball diamond, small ball can be just as captivating as long ball, and pokey ears can be weirdly hot, so Ichiro defying expectations is nothing new. RAY ALLEN: Man oh man. We finally get rings. Nothing tops this. Nothing. KEVIN GARNETT: Didja hear you tied the NBA record for most 3′s in a Finals game tonight? Way to leave it all on the floor, muthafucka. RAY ALLEN: Really? How about that. BRYAN DOO: Great work, Ray. You did good. You’re going down in the record books. You’ll have to share that record, but…they’re putting your name down. Right next to the names of Kenny “The Jet” Smith and Scottie Pippen. RAY ALLEN: So I’m in great company. BRYAN DOO: You’re right in there with the best. “Tied” with ‘em, which means “just as good,” I guess. (beat) It would’ve been sweet to get that eighth 3 though, wouldn’t it? Ah, man, that would’ve been sweet. 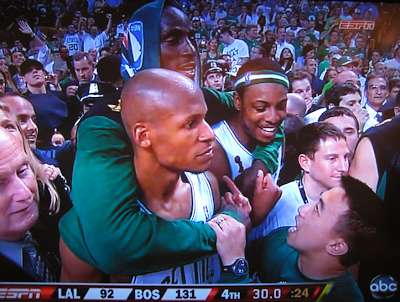 KEVIN GARNETT: Let Ray have his moment, dude. BRYAN DOO: You’re right. Let’s talk about you, KG. Let’s talk about you and your moment. How does it feel? KEVIN GARNETT: I don’t have the words. It’s a dream come true. BRYAN DOO: It was almost perfect, wasn’t it? KEVIN GARNETT: Almost? Man, it was perfect. KEVIN GARNETT: We all know that the MVP trophy is going to Paul. And he deserves it. I’m happy for him. BRYAN DOO: You’re happy for him? That’s cool. Really generous of you. KEVIN GARNETT: I’ll pick up that MVP trophy next time. BRYAN DOO: You sure will. BRYAN DOO: I mean, if there’s a next time. You never know when you’re going to get back on the big stage. But I’m sure you’re right. Next time, for sure. PAUL PIERCE: Bryan, what’s eatin’ you? BRYAN DOO: Who me? Nothing! Why would you say that? I’m happy. I’m thrilled. Look, you’re crushing the Lakers by 39 points. What do I have to be unhappy about? I’m ecstatic! I’m over the moon! PAUL PIERCE: Alright. Then chill. We’re all getting rings here, including you. BRYAN DOO: And I’m going to wear mine with pride. I’ll wear it and I’ll always think back to this moment, when we were crushing the Lakers by 39 points, wrapped up together in this awesome man-hug. KEVIN GARNETT: That’s what I’m talkin’ about. BRYAN DOO: 39 points! That’s a record. RAY ALLEN: It’s the biggest blow-out in Finals history, I guess. KEVIN GARNETT: Sweet Jesus, Bryan! Will you just spit it out for god’s sake? Say what you want to say and stop beating around the bush. My ears are bleeding, man! I just won an NBA championship! I’m going to Disney World! My mug’s going on a Wheaties box tomorrow! What kinda problem could you possibly have with that? BRYAN DOO: No problem, KG! None! I just think, you know, we could all do better sometimes, that’s all. (beat) Hey, who’s up for a three-peat, “Big Three”? RAY ALLEN: I feel like a failure. PAUL PIERCE: Life is meaningless.